It's been closed for about two years now and is currently up for sale. 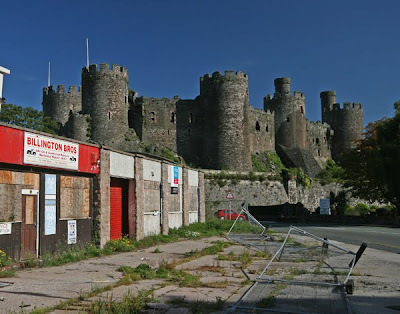 Is it really not possible that Conwy Council can release a few hundred thousand pounds from the £50m+ of reserves and use it to buy this property, demolish it and landscape the site? Please? I live in Conwy and pass this eye-sore daily. Surely something can be done by someone to improve the area as it is so close to the castle. Regularly the temporary rails on the front are pushed over and as your photo shows, vegetation is making it an even worse sight. You are right to highlight it - Oscar did earlier in the year but the criticism seems to have fallen on deaf ears. Agreed, I to have mentioned this in the past. I understand that these premises used to be the local livestock market 'in a previous life'. I think it needs a few animals now to graze the vegetation! Front page story in today's Weekly News. It seems the property was sold by Billingtons to Mueller Properties of Alsager (South Cheshire) and they are considering options including an application possibly for a mini supermarket. Cllr Joan Vaughan is voicing concern at this prospect and certainly a supermarket mini or otherwise, would have considerable effect I would have thought, on the viability of such as the Village Shop in Gyffin. Small shops are under constant pressures and it would be a great pity to see this one go. The best option would appear to be residential although even then flooding must be a risk. Still this site is being allowed to deteriorate, the vegetation has increased and the wild buddleia should be a great show in the summer although I suppose it will attract the bees and butterflies .... and the litter, and the vandalism etc.